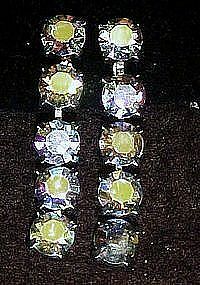 These aurora rhinestones refect mostly light blue colors with a hint of pink and yellow. It's hard to capture the color in the photo. These are quite large rhinestones each measuring 5/16" wide and has 5 of these gorgeous stones that hang loosely to enhance and shimmer to your every move. Clip backs, silver tone setting. Unsigned but in excellent condition.